Metro Sound Pros is now the only Ampetronics certified Hearing Loop installer on the East Coast! With several Manufacturer and Audiologist alliances worldwide, MSP has the technology in hand to solve the toughest Assistive Listening challenges. From Houses of Worship and Museums to Colleges and Retail facilities there is NO LIMITATION to where we can install Assistive Listening devices. No matter if it's simple room loop or a very advanced auto switching multi zone FM system MSP's design specialists and integrators can get the job done. Let MSP get your establishment up to the new ADA standards effective this March 15, 2012. All MSP’s Assistive Listening technologies comply with the IEC’s standards. MSP is a proud supporter of hearing loss communities throughout the country. See our Download section for the latest ADA Guidelines. Induction Loops are typically a copper wire that circles a room. A Inductions Loops signal is picked up by a small coil of wire inside the hearing aid, called a T-Coil. The T-Coil uses no electricity so it doesn't affect the battery life of the hearing aid. 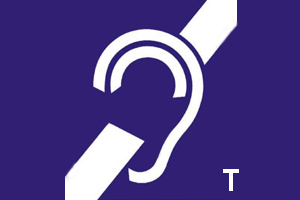 The signal from the loop plays through the customized hearing aid programming. The sound is mixed and adjusted by the hearing aid to compensate for the users hearing loss, giving as close to true sound reproduction as possible with an assistive device. Loop Questionnaire which will help us get started developing a system to fit your needs. In principle, FM system designed for hearing assistance application work just like commercial FM broadcast systems operating in the 88 to 108 MHz range. However, in the United States, the FM systems operate at FCC-designated frequency band in the rage from 72 to 76 MHz and from 216 to 217 MHz. The 72 to 76 MHz band is used for both personal and commercial applications. The 216 to 217 MHz band is intended for auditory assistance applications only. Since each system may use its own broadcast frequency, several systems can operate simultaneously at one location without interfering with one another. However, unlike the loop system, the FM system requires a special receiver for each person, whether they have a hearing aid or not. There are several listening options available for FM receivers. 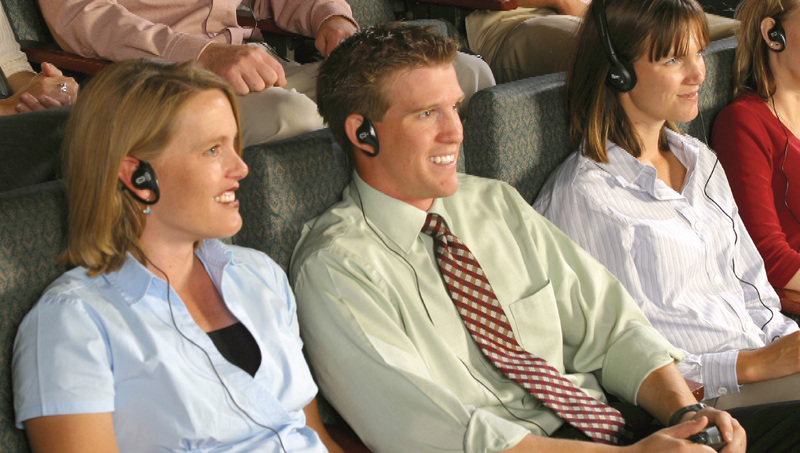 The most convenient for public facilities are the Under-the-chin type headsets or Walkman style headsets and the neck loops (personal teleloop) for T-coil users. The 72 to 76 MHz band used for commercial applications can be split into 40 narrow-band channels or 10 wide-band channels. Narrow-band systems are less susceptible radio interference than wide-band systems but receivers are generally more expensive. MSP carries both narrow-band and wide-band systems. To alleviate potential interference problems with wide- band systems, all systems carried by MSP feature field tuning to any wide-band channel. Infrared light can be used for signal transmission in same fashion as with FM transmission. An infrared system consists of three basic components: a transmitter (base station), an emitter, and a receiver. The audio signal is conveyed onto a sub-carrier in the base station which in turn is converted into infrared light by the emitter. There are four sub-carrier frequencies used for hearing assistance systems: 95 kHz, 250 kHz, 2.3 MHz and 2.8 MHz. The receiver detects the IR signal and converts it back into the original audio signal. However, unlike FM transmission and induction loop technology, infrared light cannot pass through walls. Therefore, infrared light transmission is ideal for facilities operating several systems simultaneously in different rooms in that all receivers can be identical with no need for frequency coordination. 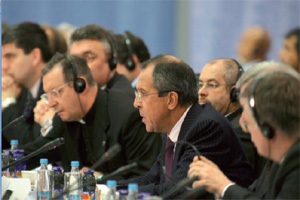 As with FM technology, each person must use a receiver, whether or not they have a hearing aid. Receiver types include lightweight under-the-chin style, over-the-head receivers for 360 degree reception and lapel style. The same listening options are available for the lapel style receivers as for the FM receivers. Metro Sound Pros is proud to offer a discount on our Assistive Listening installation services to all non-profit Hearing Loop organization donors. Contact us for more details!